The polar regions are consistently colder than the rest of the world. This is basically because the incoming solar radiation that warms Earth strikes them obliquely rather than vertically. In consequences, they receive only 40% as much as incident radiation as equatorial regions. Polar regions differ too from the rest of the world in their seasonal day lengths. In the tropics, day length varies little between summers and winters. In polar regions, summers are marked by long days and short nights, winters by the reverse. At the geographic poles, day length and seasons merge: the sun remains above the horizon for six months in summer and disappears for six months in winters. Like the rest of Earth, polar regions radiate energy to space through the year. They would radiate considerable more but for the blanketing or greenhouse effect of the atmosphere, which keeps some of the returning long-wave radiation in. As a whole the Arctic receives more solar energy than it loses, the more highly reflective Antarctic loses more than it gains. Mean air temperatures that characterize these regions are maintained by poleward flows of heat, borne by atmospheric and oceanic currents. Thus, the temperature at any time and in any part of the Arctic or Antarctic represents a point of balance between radiation gains and losses, and incoming heat from surrounding areas, all of which remain relatively stable from year to year. These balances are, however subject to long-term variations over timescales measurable in millennia, and short-term variations measurable in centuries or even decades, both due mainly to fluctuations in the amount of radiation received from the sun. 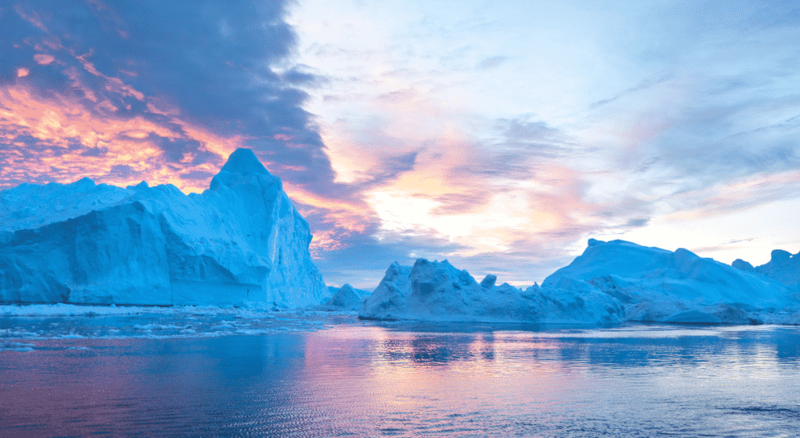 Changes that occur near the boundaries of polar regions, which involves a shift between freezing and non-freezing conditions, tend to be self-sustaining. Decreasing radiation, for example, chills ground and air, which allows more snow and ice to settle and persist: the resulting whiteness increases the albedo or reflectivity of the surface, reflecting more solar radiation back into space and causing further chilling. Thus, polar climates tend to be less stable and subject to more frequent and more drastic changes than those of temperate and tropical regions.